Profiles are even smarter in version 3! Build Parametric Assemblies instantly in PB3 with the new Auto-Assemble feature! Punch holes through anything, even nested objects! We just released version 3.0.5 which includes some important bug-fixes and usability improvements. We also updated the built-in sample assemblies! You can get a full list of the changes here. Use the PB3 ‘check for update’ feature to install the update automatically. Here’s an example of how to create a hanging chain queue barrier. We are working hard to create an epic pre-made assembly collection for you all! This tutorial will show you how easy it is to search, import, and build pre-made assemblies from our Official 3D Warehouse Assembly Collection. All assemblies are completely customizable! It’s about time I created a proper exterior wall assembly complete with corner treatment. This assembly was not possible to create using version 2 but with version 3, you can create almost anything! Oh…and you can easily change the height of the wall with the new PB3 assembly height field! I did not include air / vapor barriers, cladding, or drywall but these are relatively easy to add. Is anyone up to the challenge? 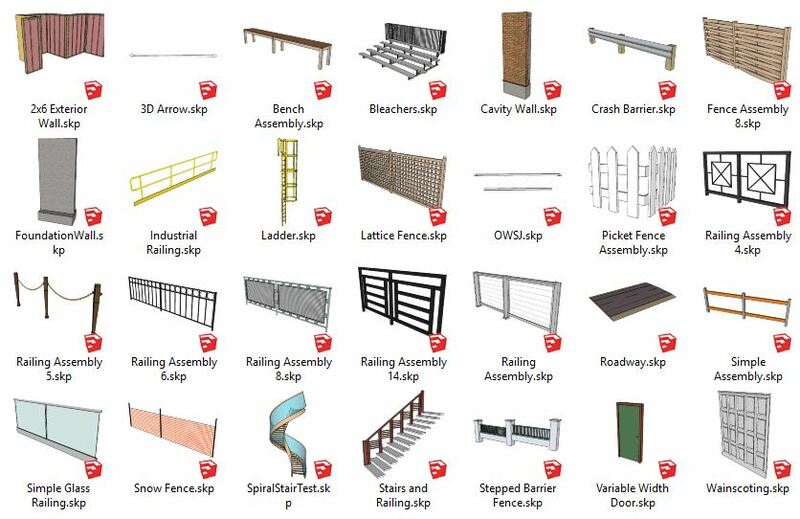 Check out this amazingly detailed parametric bleachers assembly!